The Lomonosov Ridge is an underwater formation that divides the Arctic into the Eurasia Basin and the Amerasia Basin. It, along with the rest of the Arctic, contains vast reserves of fossil fuels and minerals. Whereas previously, these resources were considered too inaccessible for profitable extraction, global warming is changing the game. Nowadays, the Arctic ice cap is shrinking by 28,000 mi2per year (Glasby and Voytekhovsky), and Arctic states have begun vying for ownership and rights to exploit the regions resource reserves. Under the United Nations Convention on the Law of the Sea (UNCLOS) treaty, a state has access to the seabed within 200 miles of its coast, within an area known as its Exclusive Economic Zone (EEZ). Beyond that, a state can access up to 350 miles out from its coastline if it can provide scientific evidence that demonstrates that the additional seabed is part of its continental shelf. Russia has put forth the claim that large swaths of unclaimed Arctic belong to it. Norway has also submitted a claim, accepted by the U.N. in 2009, and other states are sure to follow (the U.S. is not party to UNCLOS, and therefore cannot issue claims through it). These competing claims have some potential to incite conflict in the near future as our world continues to warm and demand for energy rises. It is estimated that the Arctic contains 25% of the world's remaining fossil fuel reserves (Glasby and Voytekhovsky). The Lomonosov Ridge, a 1,210-mile long underwater mountain range that runs through the North Pole from Siberia almost to the junction of Ellesmere Island and Greenland, contains a portion of these valuable resources (Glasby and Voytekhovsky). By the U.N. Law of the Sea Treaty (UNCLOS), a state has rights to and control over its Exclusive Economic Zone (EEZ), which extends 200 nautical miles (nm) out from its coastline. States can apply for rights to unclaimed marine territory through the Commission on the Limits of the Continental Shelf (CLCS). The Arctic States (the U.S., Russia, Norway, Denmark, and Canada) have the opportunity to win the rights to exploit the region. Norway has already gained access to additional seabed with an area equal to 3/4 of mainland Norway. Russia has made claims to 460,000 mi2 of territory. The U.S., preffering to negotiate with a limited number of parties, has not ratified UNCLOS, and therefore, cannot apply to the CLCS for rights to the territory. Melting ice as a result of increased rates of climate change is opening up the area for navigation and development, and countries will jostle for the chance to exploit the valuable resources contained therein, potentially leading to dangerous conflict. The quest for rights to the Arctic is heating up, because the Arctic itself has been heating up in recent years. The top of the planet is warming at twice the rate as the rest of the planet ("Global Warming Puts the Arctic on Thin Ice"). This is increasing the volume of recoverable fossil fuels: the USGS estiamtes that the Arctic contains up to 25% of the world's remaining total recoverable fossil fuels, which includes 90 billion barrels of oil, 1670 trillion cubic feet of natural gas, and 44 billion barrels of natural gas liquids in 25 geologically defined areas thought to have potential for petroleum (USGS Newsroom). This incredible volume of resources is spurring states to seek ownership of the region, and some tactics are more peaceful than others. Moscow has declared that one of its primary goals will be to establish a force "capable of securing military security" in the region (Weitz). Other states, such as Denmark and Canada, have also made moves to enhance their military presence in the Arctic. Despite such posturing, it is unlikely that the Arctic states will go to war over this issue. A hot war along Arctic battlelines would put at risk the very resources that states hope to exploit. Since the CLCS is unlikely to resolve the issue of who owns what, the Arctic Council -- a body made up of Canada, Denmark, Finland, Iceland, Norway, Russia, Sweden, and the U.S. will probably serve as the forum through which the challenge of Arctic rights will be worked out. Another facet of this case study is the plight of the indigenous peoples. Indigenous people are some of the first to feel severe effects of climate change, because of their close and often spiritual link to the environment; their dependence on the environment for their livelihood and survival; and their long experience of both mitigating and adapting to climate change. These factors combined mean that native peoples are disproportionately affected by the global warming to which they contribute only minimally. Their concerns and priorities should be addressed going forward. 1997 -- Russia ratifies UNCLOS (Bloomfield). 2001 -- Russia files first claim with U.N. for ownership of Lomonosov Ridge. The U.N. rejects the claim based on lack of solid scientific evidence (Korotun). 2007 -- Russian mini-submarine plants the country's flag in the Arctic seabed (Sonntag and Luth); U.N. General Assembly adopts the Declaration on the Rights of Indigenous Peoples (the four opposing votes come from Australia, Canada, New Zealand, and the U.S.) (Ferris). 2009 -- U.N. approves Norway's claims to expand its continental shelf to include 235,000 km2 of additional territory; Denmark begins establishing an Arctic Command within its armed forces (Weitz). For our purposes, the Arctic is understood as the region lying within the Arctic Circle, North of latitude 66° 33' North. This area consists of the Arctic Ocean and parts of Canada, Denmark (as per its ownership of Greenland and the Faroe Islands), Finland, Iceland, Norway, Russia, Sweden, and the U.S. (Sonntag and Luth, 2011). The Lomonosov Ridge, located in the polar region of the Arctic, is the highest underwater mountain range in the world. It is named for the Russian author, grammarian, poet, and scientist Mikhail Vasilyevich Lomonosov. The ridge is 1,100 miles (1,800 km) long, and it divides the Arctic Ocean into two major basins: the Eurasia Basin and the Amerasia Basin. The ridge influences water circulation, marine life, and ice movement. On the Atlantic side, the basin is 13,000 feet (4,000 m) deep, and the depth on the other side is about 11,000 feet. At one time, it was believed that the Lomonosov Ridge was a continuation of the mid-oceanic ridge with an associated seismic belt. It has been shown, though, that the seismic belt lies along the Nansen-Gakkel ridge, 250 miles (400 km) toward the Barents Sea. Thus, the Lomonosov Ridge is not part of the mid-oceanic ridge system. Lomonosov Ridge is one of the last major unexplored geographical features in the world, and it has recently become the topic of much attention and debate, owing to the large deposits of mineral resources within the shelf. Russia -- has the world's longest Arctic border of over 10,000 miles. Currently, Russia possession of some islands in the Arctic Ocean, but other than that, the country's border ends where the Arctic Ocean begins (Greene). Russia wants to change that: it first submitted a claim over the Lomonosov Ridge in 2001 to the CLCS, asserting that Lomonosov is an extension of the Siberian landmass. Winning this case would give Russia control over a sea territory of 1,200,000 mi2, an area that, according to Russian scientists, contains about 70% of the entire amount of oil and gas in the Arctic Ocean (Korotun). However, the Commission was not convinced and asked for seismology reports and sonar measurements as further proof (Bloomfield). Russia followed this assertion in 2007 with a scientific expedition that planted a flag in the Arctic seabed beneath the North Pole with a mini-submarine. This bold claim on the part of the Russians "shocked the world" ("Too much to fight over"). If the Commission accepts their claim, Russia's Exclusive Economic Zone would extend nearly all the way to the North Pole. Furthermore, a report from the Russian National Security Council indicates that it expects the Arctic to become the main source of the country's resources by 2020. As a result of this perceived importance of the Arctic's resources, Moscow declared that one of its primary goals will be to establish a force "capable of securing military security" in the region. Russia plans to file its application to the U.N. Commission on Sea Law before the end of the year (Korotun). United States -- wants to curtail Russian economic and military expansion in the Arctic region. However, the U.S. cannot legally extend claims to the Arctic continental shelf, because it has not ratified the U.N. Convention on the Law of the Sea. This treaty was signed in 1982 and implemented in 1994. Over 160 countries have ratified it (Hollis). In the U.S. opposition to ratification comes mostly from Republic senators, who object to giving too much control to an international body. Therefore, the U.S. cannot participate in the legal process in which the other party countries are engaged. One senator who opposed the treaty, Ohio Republican Rob Portman, announced on his website "we simply are not persuaded....this treaty will be more favorable to U.S. interests than bilateral negotiations, voluntary arbitration, and other traditional means of resolving maritime issues" (Hargreaves). In other words, the U.S. prefers negotiations with a limited number of partners. Another factor for opting out of the treaty may relate to the fact that most of the sizable oil and gas reserves that the U.S. could lay claim to already lie within 200 miles of U.S. coast; little could be gained by seeking to expand the EEZ (Hargreaves). Norway -- submitted a claim to 235,000 additional square kilometers of continental shelf that was approved by the U.N. in 2009. The new territory is equivalent in size to 3/4 of mainland Norway (Pettersen). Canada -- represents Russia's biggest Arctic rival (Cummins). Canada has territory extending northward to the Queen Elizabeth archipelago, which contains Ellesmere Island. Russia's 2007 seabed stunt helped spur other Arctic nations into action. Canada has announced that it will build eight armed ice-breaking ships (Bloomfield), and it, like Russia has recently sent troops to the Arctic to strengthen its claims (Cummins). Denmark -- recently conducted its second scientific investigations to gather proof that Lomonosov is part of the continental shelf of Greenland. The goal is to submit a formal claim to the CLCS by November 2014 (Cornejo). The country has identified five potential claim islands off the Faroe Islands and Greenland. The North Pole lies 380 nm north of Greenland ("Danes Seek Proof North Polar Area is Theirs"). Commission on the Limits of the Continental Shelf (CLCS) -- a U.N. body made up of scientists, the Commission provides recommendations concerning the boundaries of a state's continental shelf. Its purpose is to "facilitate the implementation of the United Nations Convention on the Law of the Sea." (CLCS 2012). However, as an advisory body, the CLCS lacks any real legal power. Article 9 of the UNCLOS Annex II states that CLCS's recommendations "shall not prejudice matters relating to delimitation of boundaries between States with opposite or adjacent coasts" (Sonntag and Luth, 2011). For the Commission's recommendations to have any weight, the Arctic States (including the U.S.) must expressly accept them. Rising global temperatures: each year brings new minimums of Arctic sea ice. 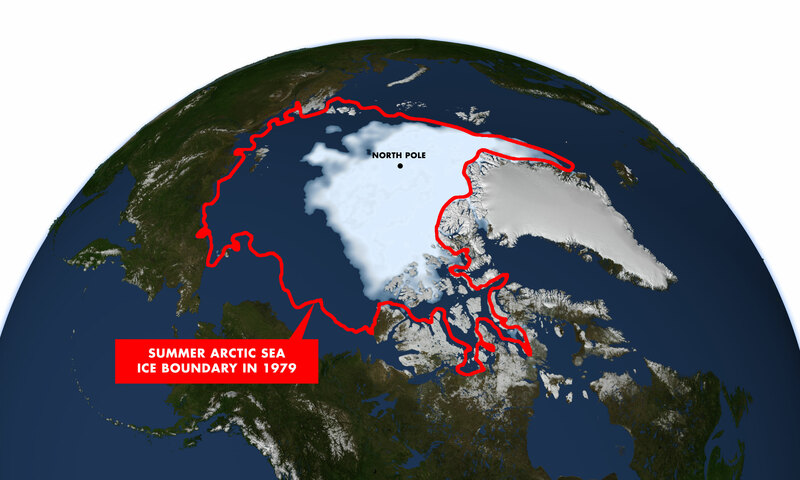 With NASA satellites showing that permanent ice cover is decreasing by 9% each decade, it is predicted that the Arctic Ocean will become nearly ice-free in summer within this century. The Arctic ice cap is shrinking by 28,0 00 mi2 (70,000 km2) per year. This results in large swaths of water opening up in the ice, making the possibility of commercial recovery of oil, gas, and minerals increasingly economically viable (Glasby). It also affects the feeding and migration patterns of wildlife such as polar bears, walrus, whales, and seals. The warming of the Arctic threatens the cultural identity and survival of many native Arctic peoples as rising sea levels threaten to flood their villages ("Global Warming Puts the Arctic on Thin Ice"). About 4 million people live in the Arctic, of which 400,000 are considered indigenous. Indigenous people are some of the first to feel severe effects of climate change, because of their close and often spiritual link to the environment; their dependence on the environment for their livelihood and survival; and their long experience of both mitigating and adapting to climate change. These factors combined mean that native peoples are disproportionately affected by the global warming to which they contribute only minimally. The ecosystems that indigenous peoples rely on suffer heavily from warming temperatures. For instance, loss of sea ice and warmer waters reduce sea mixing and nutrient availability. As a result, the entire food web suffers, including the fish that feed on the algae and on which aboriginal Canadians and Greenlanders depend. Without the natural barriers that the sea ice forms, storms impact coasts more severely and cause higher levels of erosion. Figure 1: Pop. of indigenous groups by region (Ferris, 11). (b) The act that inflicts harm may be physically elsewhere. Most scientists consider what is happening now in the Arctic as a signal of what is to come in other regions of the world as climate change continues to intensify. Melting glaciers and ice sheets contribute to rising sea levels, which pose dangers to coastal regions worldwide through beach erosion, coastal flooding, and contamination of freshwater supplies. Scientists project sea level rises as high as 3 feet by 2100, which would cause about 22,400 mi2 along the Atlantic and Gulf coasts of the U.S. to sink underwater. Entire island nations, such as the Maldives could disappear. Temperatures in the Arctic are rising at twice the rate of the rest of the globe, causing rapid ice melt. This is especially unfortunate, because as snow and ice cover melts, the earth absorbs more sunlight and warming intensifies in a feedback loop ("Global Warming Puts the Arctic on Thin Ice"). International Law provides the framework for dealing with the issue of ownership of the Arctic. The framework in question is that of the United Nations Convention on the Law of the Sea, which divides the sea and its resources into legal zones based on distances from each state's coastal baseline. 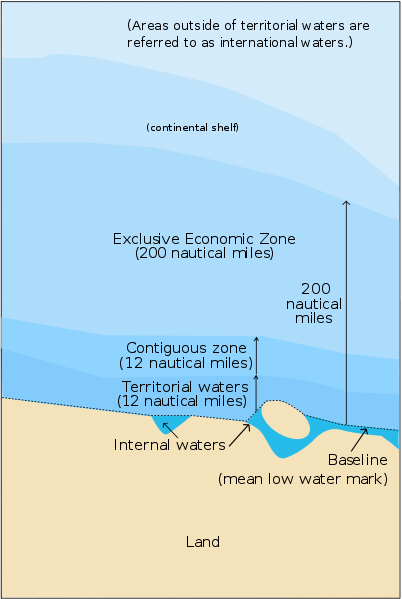 These zones are known as: the Territorial Sea (up to 12 nautical miles (nm) from the baseline), the Contiguous Zone (up to 24 nm), and the Exclusive Economic Zone (up to 200 nm) (EEZ). Within these zones -- that is, within 200 nm from a state's coast, that state is free to exploit any natural resources lying in the seabed. Anything beyond that is referred to as the High Sea, and it is in this area that seabed rights are far less certain. While forbidden from autonomously salvaging natural resources from High Sea areas, states are able to apply to and cooperate with the International Seabed Authority. The state may also access mineral rights to a far-flung seabed if it can prove that the resources lie within its continental shelf. The continental shelf consists of the maritime area and its subsoil attributable to a coastal state as a natural extension of its land territory. If one of the Arctic countries can prove that parts of the Arctic are geographically connected to its continental shelf, that country can take over ownership of that land and its valuable resources. An interested state must apply to the CLCS. The application must include supporting scientific and technical data that demonstrates that the disputed area is in fact part of the claimant state's continental shelf. However, there are limits to this arrangement. Even if a state can scientifically prove that a portion of the seabed out on the High Sea is connected to its continental shelf, it still cannot lay claim to land over 350 nm from its baseline, or 100 nm from the 2,500 meter isobath, whichever is more favorable to the state. The isobath is a conceptual line that connects all points of the same depth underwater. This isobath line would prove more favorable to many Arctic States, because much of the Arctic region is flat. Yet, due to a caveat, the resource-rich Lomonosov Ridge cannot be so easily claimed. A formation is dubbed a "submarine ridge" if the continental shelf covers part of the formation. In this case, the shelf cannot be extended to more than 350 nm from the coast, regardless of where the 2500 m isobath line falls. This makes the case for claiming Lomonosov Ridge by any one state far more complicated. Yet some states are still trying. Although ridges cannot be claimed out to the isobaths, submarine elevations can be. This is because elevations are similar in composition to the continental martin, while ridges are generally formed from volcanic rock -- a different material from its adjacent continental shelf. The Arctic contains a large number of underwater mountain ranges. In order to scientifically determine whether a formation is an elevation or a ridge -- and hence, whether a state may claim it -- a geologic analysis of the rock must be completed. Russia asserts that the Lomonosov Ridge is a submarine elevation, meaning that, by the Convention, the country could claim it via the 2500 m isobath rule. However, scientific evidence up to today indicates that the Ridge is not a natural component of Russia's continental margin. This conflict is of an international nature. Countries that have tried or may try to lay claim to Lomonosov Ridge are Russia, Canada, and Denmark (through the territory of Greenland), and the U.S. and Norway may wish to make their own cases as well (although the U.S. is not party to the UNLOS treaty). The U.N. itself will be strictly uninvolved, since it does not settle cases of disputed territory. The huge volume of resources contained in the Arctic make claiming it an enticing prospect. According to the USGS, "the area north of the Arctic Circle has an estimated 90 billion barrels of undiscovered, technically recoverable oil, 1670 trillion cubic feet of technically recoverable natural gas, and 44 billion barrels of technically recoverable natural gas liquids in 25 geologically defined areas thought to have potential for petroleum" (USGS Newsroom). There is another component to this case study: the plight of the Arctic natives. Their predicament is not just one of resources. Crate describes the situation of indigenous persons in the Russian North: "their sense of place and their understanding of 'homeland' are both tied directly to an ecosystem dependent on water in its solid state" (Crate, 142). In Greenland, place names refer to physical features, such as hunting grounds. When the physical features disappear, invalidating place names, a sense of homelessness ensues. Traditional knowledge concerning where to hunt and plant is no longer as reliable as it was in the past (Ferris 15). In a sense, violence is being done to, not just their physical livelihood, but to the very base of their cultures and senses of self-perception. So far, there have been no known fatalities associated with claims on mineral resources from the Lomonosov Ridge. Proceedings in the Arctic have in fact been quite peaceful. However, the idea of conflict in this region is not completely unprecedented. There have already been "minor tensions" between Russia and Norway in regards to fishing rights around the Spitsbergen archipelago. Mobilization of armed forces to the Arctic has also increased. Both Canada and Russia have sent troops up north to strengthen their territorial claims. The Prime Minister of Canada, Stephen Harper, criticized Russia for its aggressive strategy. There have been allegations that Russia has made incursions into Canada's Arctic airspace, a claim Moscow denies. Mr. Harper says that Russia's actions strengthen Ottawa's committment to the Arctic (Cummins). However, Canada has also been ramping up its military capabilities in the region. The country recently conducted its largest Arctic military exercise ever, involving over one thousand troops, military aircraft, naval vessels, and unmanned drones (Weitz). The thawing of the ice has made the aforementioned mineral resources more accessible, appealing, and viable as a source of energy. There is potential for the U.S., Canada, and Denmark to be drawn into the competition as well: "the scramble for resources will intensify" (The Guardian, 2008). Yet, four of the five Arctic states are NATO members and, most analysts agree, unlikely to go to war. As for Russia, it has so far behaved peacefully. As one observer puts it, "if the United States and Russia were able to survive 40-plus years of Cold War antagonism, it's unlikely they'd go to war over...drilling rights" (Hargreaves). In fact, since Russia's Siberian coastline makes up nearly half of the Arctic coastline, it would prove downright unprofitable for Russia to incite armed conflict that may endanger its potential claims. In 2008, the EU's two foreign policy officials issued a report to the 27 heads of government after a summit in Brussels regarding the potential conflicts that climate change and restricted access to resources could cause in the decades ahead. Highlighted in the report is the case of the rapidly thawing Arctic and Russia's attempts to lay exclusive claim to the resources beneath the ice. This is significant, because developments in the Arctic have "potential consequences for international stability and European security interests." Climate change has certainly exacerbated this conflict. Previously, the resources beneath the Arctic ice were considered inaccessible and not worth the high price of extracting them. However, recent global warming has been depleting Arctic ice more rapidly than many predicted. The Arctic is warming at a rate nearly twice that of the rest of the earth. According to the final report of a four-year study conducted by hundreds of scientists called the Arctic Climate Impact Assessment, "average winter temperatures have increased by 3 - 4 degrees Celsius in the past 50 years in Alaska, Western Canada, and Eastern Russia; and the Arctic is projected to warm an addition 4 - 7 degrees Celsius by 2100" (Currie, 2007). This has led to accelerated melting of sea-ice, which threatens arctic wildlife and poses challenges to indigenous peoples. This alarming temperature rise is good news to those who would like to exploit the resources being made increasingly available by disappearing ice. In 2010, American admiral and NATO's top officer in Europe, James Stavridis, stated that, while "for now, the disputes in the north have been dealt with peacefully...climate change could alter the equilibrium" (The Economist, 2012). Competition over these resources could lead to grave consequences. For instance, the 2008 EU report warns of the possibility of a serious conflict materializing between the Russian Federation and Norway, as these two countries have already submitted their claims to the CLCS. Such an occurence would draw in the remaining Arctic States -- the U.S., Canada, and Denmark -- out of competition for the energy resources and raw materials. The report also contains a broader warming: that of increased rich-poor and north-south tensions. This is because climate change is mostly driven by wealthy northern and western nations, while its effects will be most catastrophic in the poorer global south. It is estimated that the Lomonosov Ridge could contain multiple billions of barrels of oil equivalent alone. Preliminary estimates from USGS satellite data in 2008 predict about 90 billion barrels, and more data is being collected. Melting ice as a result of increased rates of climate change is opening up the area for navigation and development, and countries will jostle for the chance to exploit the valuable resources contained therein, leading to potentially dangerous conflict..
As can be seen in the above causal diagram, an increase in climate change and Arctic temperature will lead to higher resource availability. If these resources are exploited and the fossil fuels burned, this will have a positive effect on climate change, causing temperatures to rise even further. The cycle repeats itself in a vicious, continuing loop. At the same time, countries seeking rights to the Arctic are increasing demand for these energy resources. This factor will help intensify the cycle that is driving global warming. Very high; some reports estimate that the Arctic contains up to 22% of the earth's remaining undiscovered, technically recoverable fossil fuel resources (USGS Newsroom). As of now, it is uncertain which Arctic States will win rights to expand their EEZ beyond 200 nm into the Arctic. However, the CLCS will likely not have the final say in the resolution of these disputes, due to the fact that the U.S. is not party to the UNCLOS. Not being a member means that the U.S. is not bound by the provisions of the agreement, and it is not able to submit an application to the Commission. If the CLCS, as an advisory board, cannot resolve the issue of disputed rights to the Arctic, the Arctic States may turn to joint development agreements for the exploitation of the region's natural resources. This could be done within the Arctic Council, which comprises Canada, Denmark, Finland, Iceland, Norway, Russia, Sweden, and the U.S (Weitz). Within this body, states could cooperatively work out a framework for divying up rights to the Arctic and its vast resources. "90 Billion Barrels of Oil and 1,670 Trillion Cubic Feet of Natural Gas Assessed in the Arctic." USGS Newsroom. United States Geological Survey. 23 July 2008. Web. Accessed 3 May 2013. Bloomfield, Adrian. "Russia Claims North Pole with Arctic Flag Stunt." The Telegraph. 1 August 2007. Web. Accessed 4 May 2013. “Climate change may spark conflict with Russia, EU told.” The Guardian. 9 March 2008. Web. Accessed 28 Jan. 2013. "Commission on the Limits of the Continental Shelf (CLCS) Purpose, Functions, and Sessions." United Nations. Division for Ocean Affairs and the Law of the Sea. 2012. Web. Accessed 30 April 2013. Cornejo, Ricardo. "Dealing with Territorial Claims in a Thawing Arctic." Global Economic Intersection. 12 August 2012. Web. Accessed 3 May 2013. Crate, Susan S. "Gone the Bull of Winter? Contemplating Climate Change's Implications on Northeastern Siberia, Russia," in Susan A. Crate and Mark Nuttall, eds., Anthropology and Climate Change: From Encounters to Actions. Walnut Creek, CA: Left Coast Press, Inc. 2009. p. 142. Cummins, Chip." 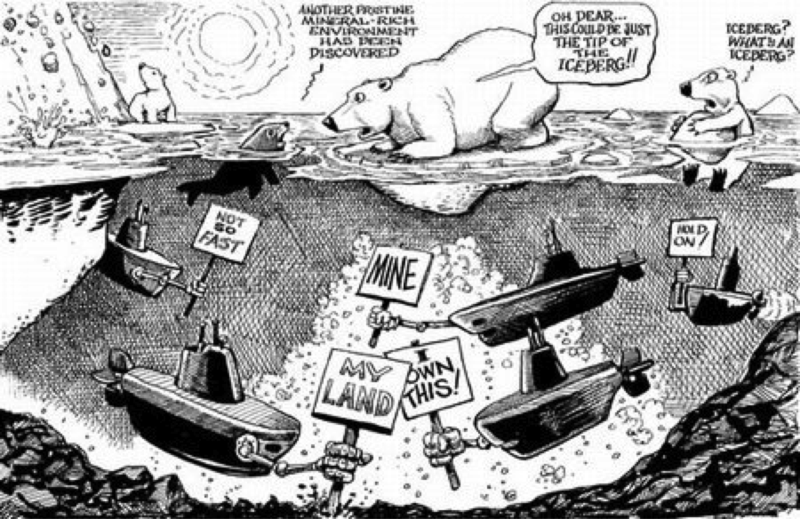 Canada Presses Claims Over a Chunk of the Arctic." The Wall Street Journal. 28 Sept. 2011. Web. Accessed 3 May 2013. Currie, Duncan E.J. “Sovereignty and Conflict in the Arctic Due to Climate Change: Climate Change and the Legal Status of the Arctic Ocean.” International Continental Scientific Drilling Program. 5 August 2007. Web. Accessed 28 Jan. 2013. "Danes Seek Proof North Pole Area is Theirs." Barents Observer. 31 July 2012. Web. Accessed 3 May 2013. Ferris, Elizabeth. "A Complex Constellation: Displacement, Climate Change, and Arctic Peoples." Brookings-LSE Project on Internal Displacement. 30 Jan. 2013. Web. Accessed 5 May 2013. “Geologists Ship Out, Hoping to Claim Piece of Arctic for Canada.” Science Insider. 19 August 2011. Web. Accessed 28 Jan. 2013. Glasby, G.P. and Voytekhovsky Yu. L. "Arctic Russia: Minerals and Mineral Resources." Geochemical Society. July 2009. Web. Accessed 3 May 2013. "Global Warming Puts Arctic on Thin Ice." National Resources Defense Council. 2005. Web. Accessed 3 May 2013. Greene, David. "Russia Pushes to Claim Arctic as its Own." National Public Radio. 16 August 2011. Hargreaves, Steve. "U.S. Missing out on Arctic Land Grab." CNNMoney. 18 July 2012. Web. Accessed 3 May 2013. Hollis, Daniel. "United Nations Convention on Law of the Sea (UNCLOS), 1982." The Encyclopedia of Earth. 22 June 2010. Web. Accessed 3 May 2013. Korotun, Lada. "Russia Claims for Arctic Riches." The Voice of Russia. 27 March 2013. Web. Accessed 4 May 2013. "Lomonosov Ridge." Encyclopædia Britannica. Encyclopædia Britannica Online Academic Edition. Encyclopædia Britannica Inc., 2013. Web. Accessed 27 Jan. 2013. Petterson, Trude. "The official submission for Russia's claim to Arctic shelf borders expansion is nearly read, Russian Deputy Prime Minister Sergei Ivanov said." Barrents Observer. 13 Dec. 2011. Web. Accessed 4 May 2013. "Report of the Indigenous Peoples' Global Summit on Climate Change, 2009," para 58, p. 23. Web. Accessed 4 May 2013. 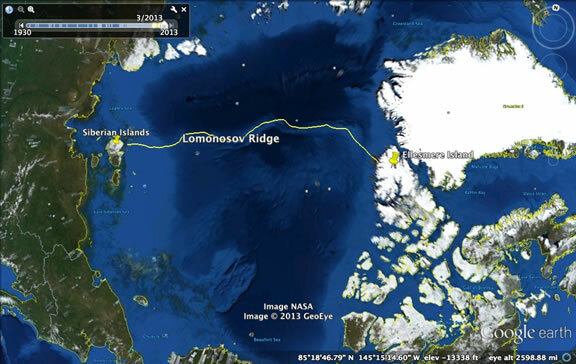 “Russia and Canada seek UN ruling on Lomonosov Ridge.” BBC News Europe. 16 Sept. 2010. Web. Accessed 27 Jan. 2013. Sonntag, Marc and Luth, Felix. "Who Owns the Arctic? A Stocktaking of Territorial Disputes. "The Global Journal, 21 Dec. 2011. Web. Accessed 27 April 2013. “Too much to fight over.” The Economist. 16 June 2012. Web. Accessed 28 Jan. 2013. Weitz, Richard Phd. "Putin Seeks Arctic Riches." Second Line of Defense. 2013. Web. Accessed 6 May 2013.